South East Asia prized game fish. The Giant Snakehead has been one of the most sort after game fish for lure fisherman in Asia. Known for its brute strength and powerful jaw that area able to destroyed lure after being hammered by this formidable and notorious fish. It is the largest species in the Channidae family. With the ability to grow up to 1.3m, with an expected weight of 20kg or 44lb. Due to its extraordinary size and fearsome predatory instinct, makes them chase after artificial lures. Giant Snakehead is a native fresh water fish and can be found across fresh water lakes, swamps and slow-flowing river across South East Asia. Giant Snakehead feeds on other fish and other small creatures that shares the same habitat. This also includes frogs, small birds and mammal. Mature Giant Snakehead is a very beautiful fish. With a distinctive white underbelly and stripped/spotted black and purplish at the half part of their body. Long body and huge paddle like tail makes it a powerful fish. The huge tail helps it launch from their hideout when stalking helpless pray. The scariest part is it strong jaws and sharp teeth. Giant Snakehead can take a big bite or a chunk of the pray body as their meal. They would only go after live pray and once the pray succumb to injury, they would leave it. There are reports of Giant Snakehead attacked humans as fingers are mistaken for small pray. Usually happens when they stocked their aquarium with Giant Snakehead. 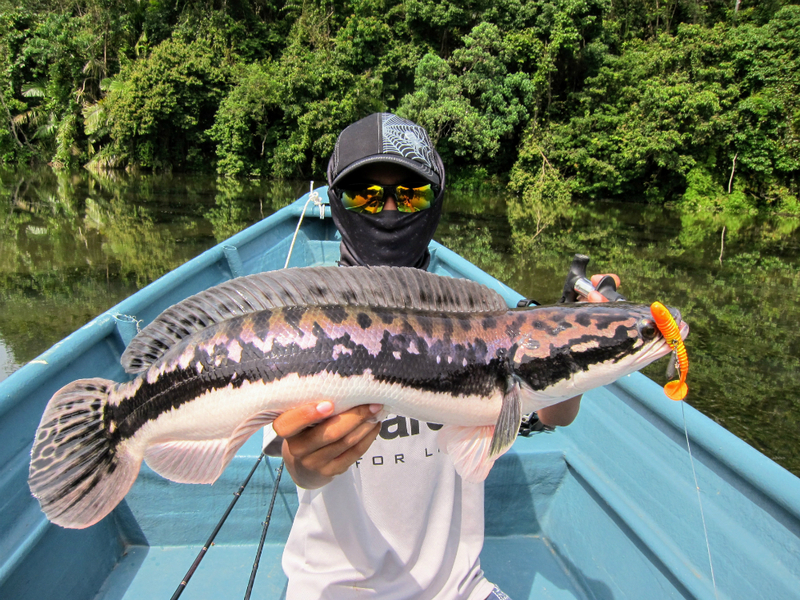 Giant Snakehead is one of the most sought after Game Fish Species in Malaysia among local and international anglers. Rod manufacturers would introduced specialized rod and lures for the Giant Snakehead, Making it stronger to withstand their strength. It holds a special place among lure fisherman as it can be addicting when it comes to outsmart the fish and tame its brute strength. Beautiful coloration. The Giant Snakehead has a white belly, and Black-Purple-Green upper part. There are many proven method to catch this beautiful fish. 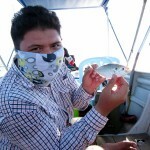 It can either be conventional or technical fishing method, all depends on the anglers preference. 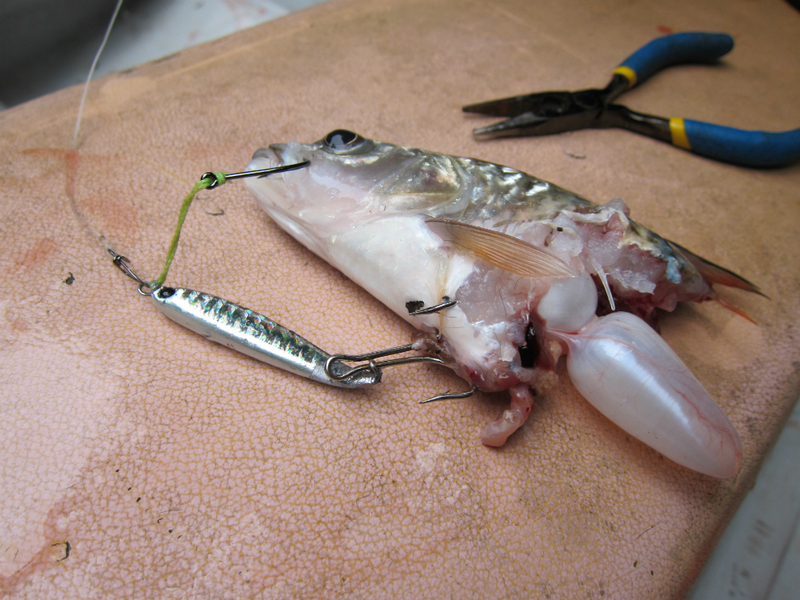 The conventional or effective way of doing it is to use a live-bait. 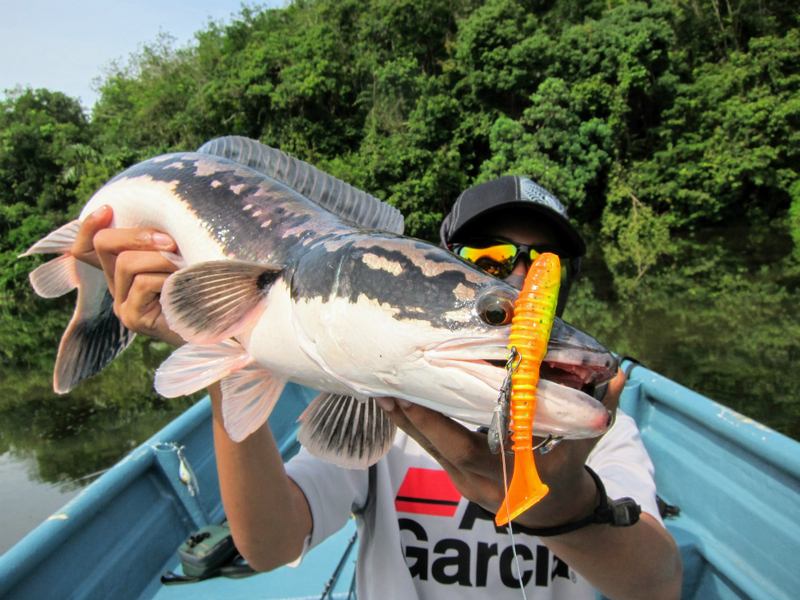 Undoubtedly, this is the best way of catching a Giant Snakehead. A simple Carolina Rig is sufficient with a strong steel leader and a large strong hook. Sight cast are effective, we usually see the fish rises and respond quickly by casting the live bait as close as possible to their surface area. Bite happens seconds after the bait sinks or after it reach their striking distance. There are limitation when we are using live-bait. First of all is the fishing ground itself. Most of the time, it is filled with underwater structure. Getting snagged between trees or structure is easy and when you have to retied it over and over again, it can be frustrating. This also eliminate any opportunity to fish off heavy covers and shallow weedy area. 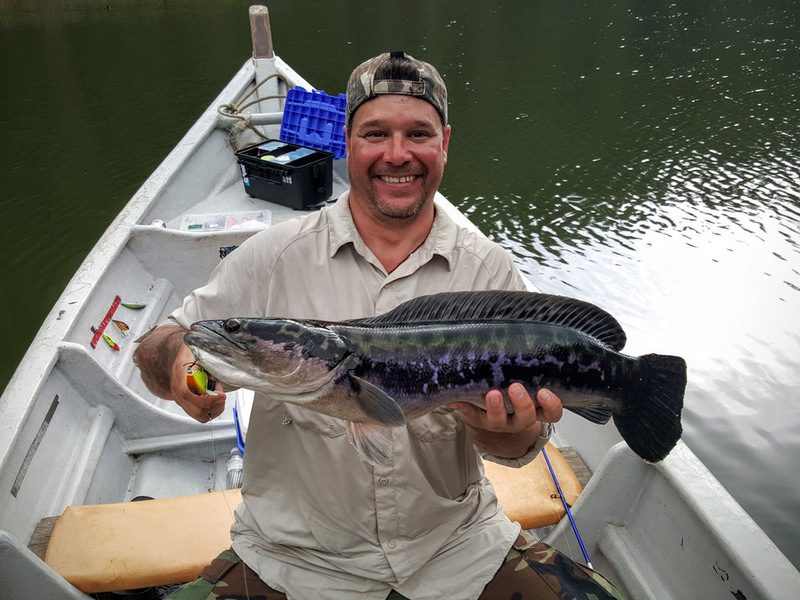 Fishing with artificial lure gives anglers a range of options to trigger the Giant Snakehead to bite. Deep Diving Crank Bait is suitable in open, deep water. Usual depth range from 4-6m, and is effective when we cast the lure as close as possible to the fish when it rises. Color variation from bright to natural, it is a must have lure in your tackle box. 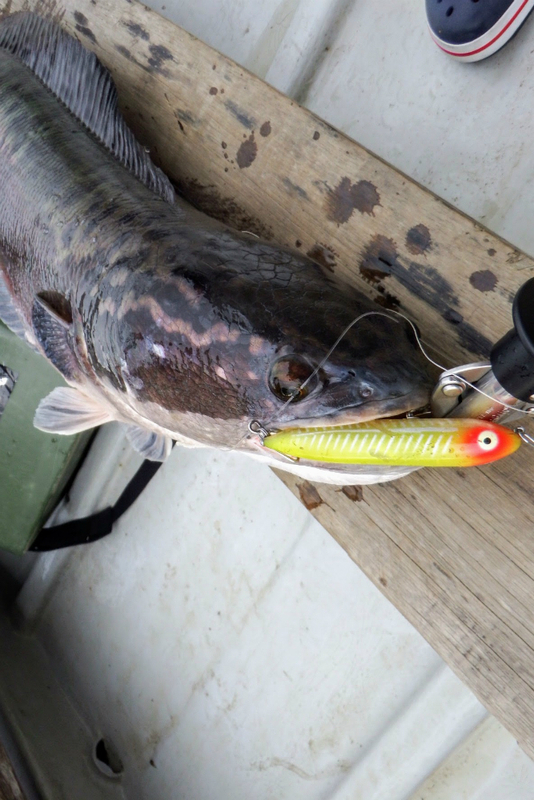 Top Water Plug is another range of lures that are effective in luring Giant Snakehead to strike. Top water plug are effective when fishing above heavy structure or even shallow banks. It mimic an injured bait fish or other small pray. 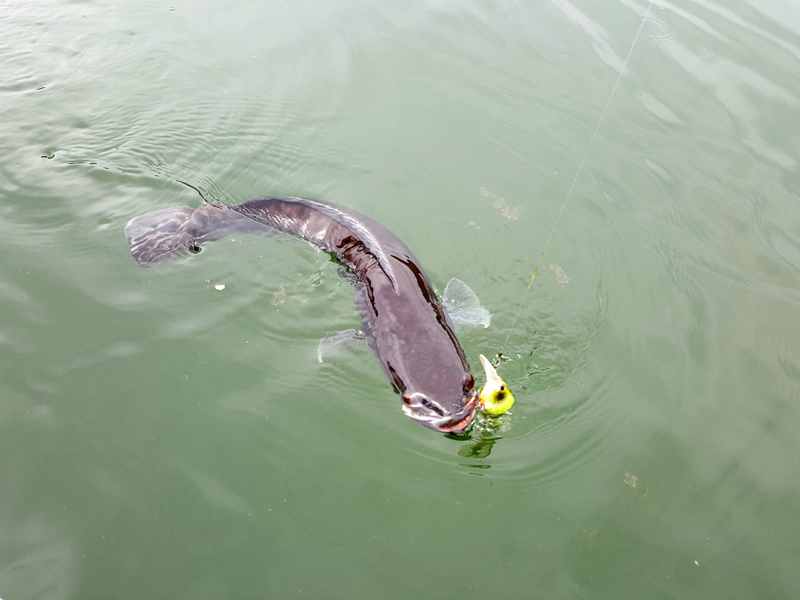 Strike happens when the lure passes by the Giant Snakehead hideout or a bait fish ventured outside their safe haven and into the predatory hunting ground. 18lb Giant Snakehead devours this large Heddon Spook! 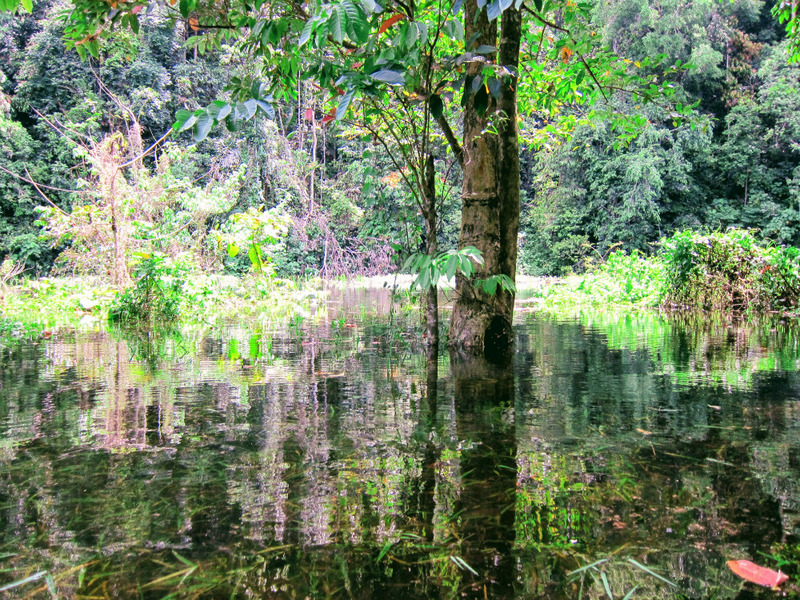 A great scenario to use Topwater to entice a Giant Snakehead strike. 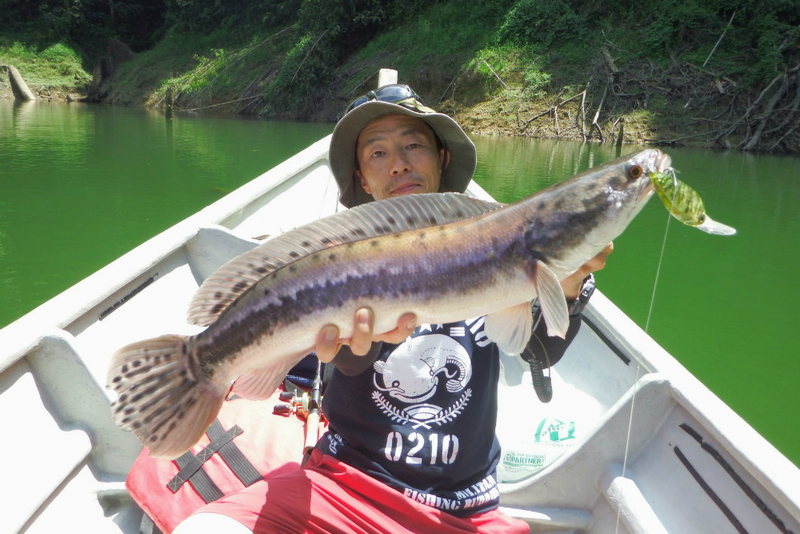 Michio Sanada using a 6m diver, Deps Cascable for Giant Snakehead. A specialize technique were developed in Japan for a specific snakehead species called a Raigyo. Using buzzbait, spinner baits, soft plastics and artificial frogs. Lures are design to be weedless and the rods and reel were heavy ratings to pull the fish out off the heavy covered area. Covered with vegetation and weed. This technique expands across South East Asia and were accepted here in Malaysia. 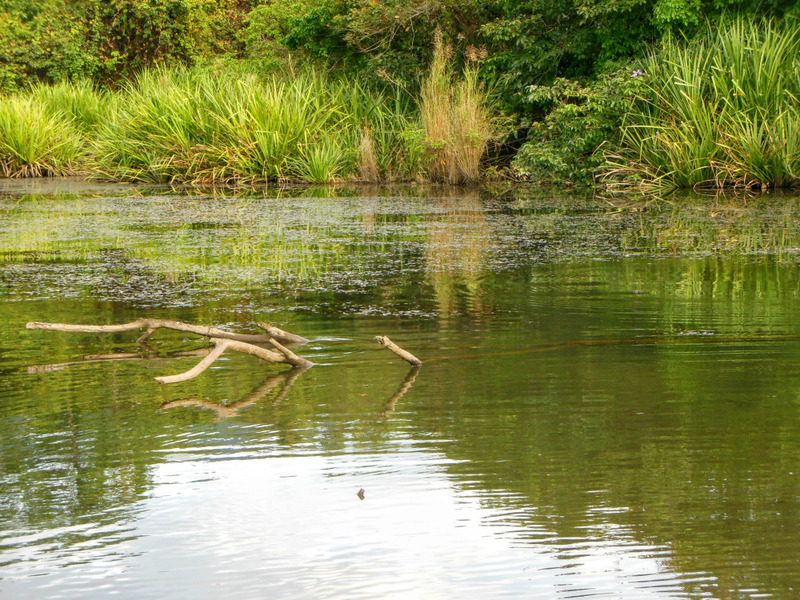 The fish would stalk pray just inches from the surface and uses the weed and vegetation for cover. It is a power game and once the lure is being struck, the angler need to pull it out as fact as possible. Heavy Cover Game and Close Quarter Battle! Soft plastic and weedless hook is effective in heavy covered area. Victim of a large Giant Snakehead bite. A beauty! Sharp teeth and greenish purplish color scheme! Giant Snakehead is on of the best freshwater game fish and should be in every anglers bucket list. Despite it being on the anglers prized game fish list, Giant Snakehead is also on the menu at some restaurant. The thick firm white flesh were made into local delicacies and now the fish is being poached at a worrying number. 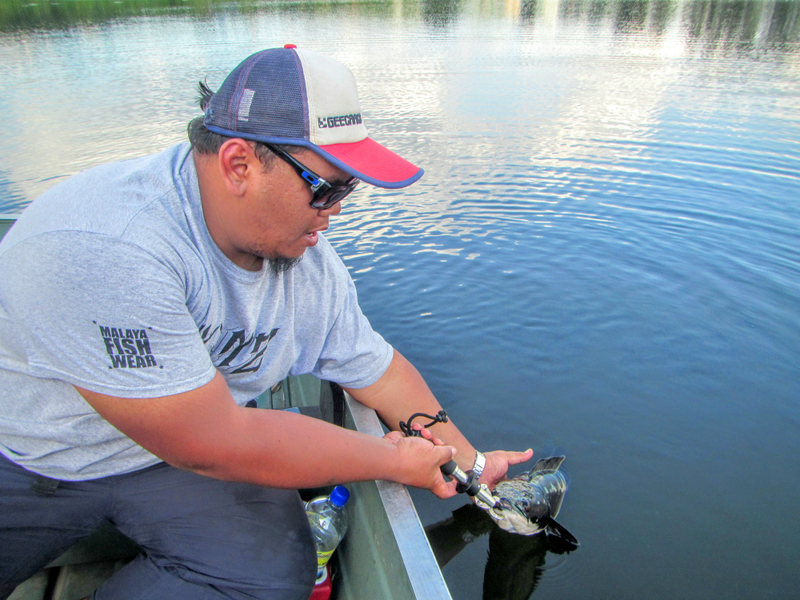 Conservation effort is needed to maintain a good number of Giant Snakehead in the ecosystem. Without them being the apex predator, other invasive apex predator might take over and disrupt the ecosystem. 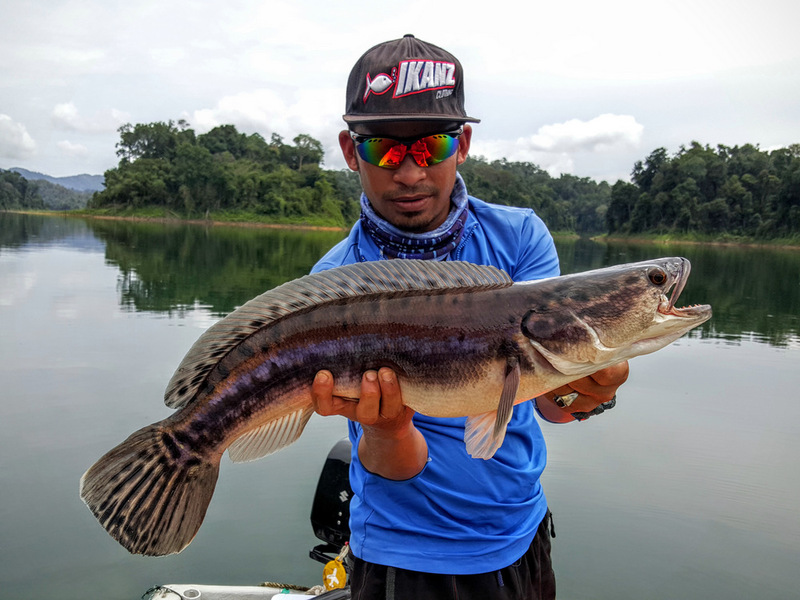 Catch and release when possible to ensure Giant Snakehead will always be part of Malaysia’s Game Fish. Catch and release and respect this magnificent species!! The author needs to learn how to spell and use English in context. It’s prey not PRAY.